A traditional Christmas treat in Guyana, black cake is rich and moist. If you can, make it in the first week of November, so there’s time for the flavours to develop. 1. Place the mixed fruit, mixed peel and nuts in a food processor and blitz until evenly processed. Place in a bowl and pour over 150ml of the rum, cover and set aside to soak overnight or in the fridge for up to a week, stirring occasionally. 2. Preheat the oven to 150°C, gas mark 2. Grease and double line a 20cm square cake tin with baking parchment. 3. Cream the butter and sugar until light and fluffy and pale in colour. Add the eggs one at a time, beating between additions. Tip in the soaked fruit and nuts with the soaking liquid and stir well. Stir in the black treacle to make the cake as dark as you wish. 4. Sift together the flour, baking powder and mixed spice and gently fold it into the mixture a tablespoon at a time. Continue until you have a soft dropping consistency, adding more rum as required. Pour the mixture into the cake tin and bake for 1¾-2 hours, until a skewer inserted into the centre comes out clean. 5. While the cake is still warm, make holes all over the top of the cake with a skewer then drizzle over the remaining rum. Allow to cool completely, then wrap in several layers of greaseproof paper. In the weeks leading up to Christmas, 'feed' the cake occasionally by drizzling over more rum. 6. 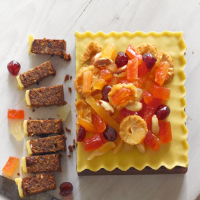 The cake can be iced in the traditional British way, or given a thick layer of marzipan with dried tropical fruits and nuts arranged on top and glazed with apricot glaze, in the traditional Guyanese way.